Wrapper: Cameroon. Filler: Honduran, Nicaraguan, Dominican (Piloto Cubano). Binder: Connecticut Broadleaf. Country of Manufacture: Honduras. Factory Name: Honduras American Tabaco S.A., Cofradia, Honduras. -- The history: Excalibur 1066 is truly "The people's choice" cigar. We asked cigar enthusiasts to determine which of two blends should be incorporated into our new cigar, and the blend in the Excalibur 1066 was their choice. The cigar: Excalibur 1066 is the first cigar that has ever combined the rich Honduran taste with the richness of a Cameroon wrapper. The blend is a combination of Honduran, Nicaraguan and Dominican tobaccos. The character of the cigar is further enhanced by a select Broadleaf binder grown in the Connecticut River Valley. 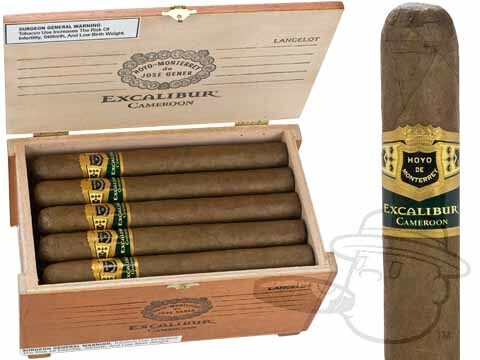 The experience: Excalibur 1066 gives the discriminating smoker the very best of two worlds, rich flavor and Connecticut smoothness. Only ordered one box of these cigars. I did not know what to expect and it was a pleasant surprise. Excalibur 1066 Lancelot Cameroon is rated 3.9 out of 5 based on 2 customer ratings.